I've spoken about protected intersections before. They're really common in the Netherlands and some other parts of Europe. The concept is catching on in the United States (tested on a street in Minneapolis but no permanent installations yet as far as I can tell). 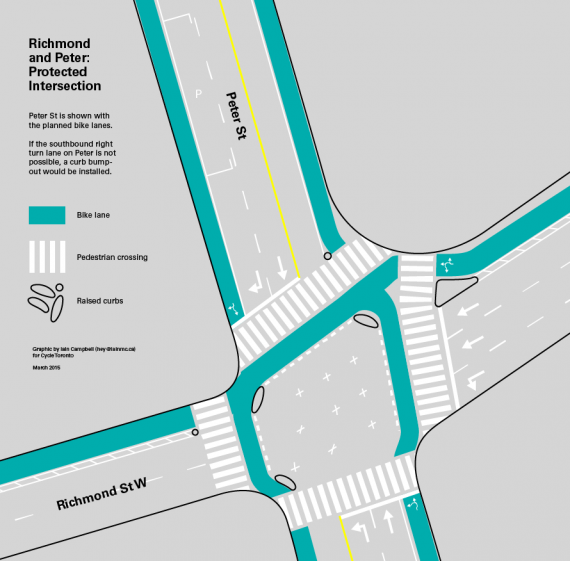 Iain Campbell, Cycle Toronto volunteer and designer, has created a way for us to visualize how a protected intersection would work where Richmond and Peter streets intersect. Peter and Richmond would be a perfect test case (Cycle Toronto agrees). The intersection is much wider than it needs to be and it allows cars to make turns at high speed. 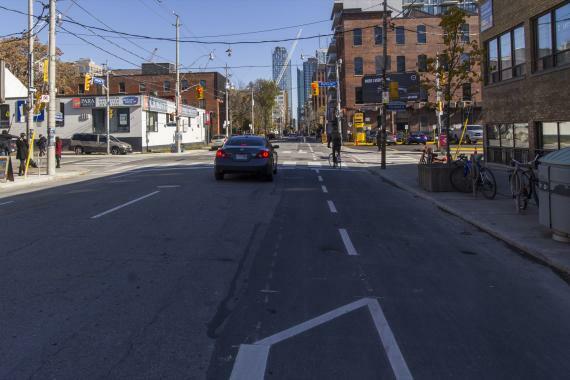 Since there are plans for bike lanes on Peter and protected bike lanes on Richmond the two can be configured to improve the ways motor vehicles and bicycles will intersect. In North America, planners figure the best option is to let the cyclists and drivers "intermingle". The big downside is that a cyclist is only as safe as the least safe portion of their trip. Most injuries and collisions happen at intersections. The forced intermingling at intersections is challenging and stressful situation for cyclists. And I daresay it is also less safe given that the Netherlands has worked steadily in removing these types of intersections. A disappearing bike lane creates uncertainty for all road users: motor vehicles don’t know whether to wait for cyclists to pass on the right, or proceed, potentially cutting off cyclists. Nick Falbo of Alta Planning, borrowed the concept from the Netherlands and is promoting the "Protected Intersection" as a safer alternative. The protected intersection slows drivers down because of the tighter turning radii. When the driver does cross the cycle track they are better able to look straight ahead to see if a cyclist is there (as opposed to straining to look over one's right shoulder around a blind spot). The cyclists are more visible. And it provides a clearer cue to who has the right of way, just as pedestrians have the right of way in the crosswalk. I hope City planners will take the opportunity of the pilot project on Richmond and Adelaide to try out this really innovative idea; an idea that already has widespread positive data in other countries. Here's our chance to lead in at least one thing in North America.